The Dawn Jogger is certain the celebration of the male DJ’s life began in reality when she first set foot in London a few days ago, but it has certainly accelerated since her arrival with friend Kent in Ameungy/Taize yesterday. Today began her day with the male DJ would have begun, with the morning service at Taize, then breakfast followed by a good walk around the surrounding countryside. 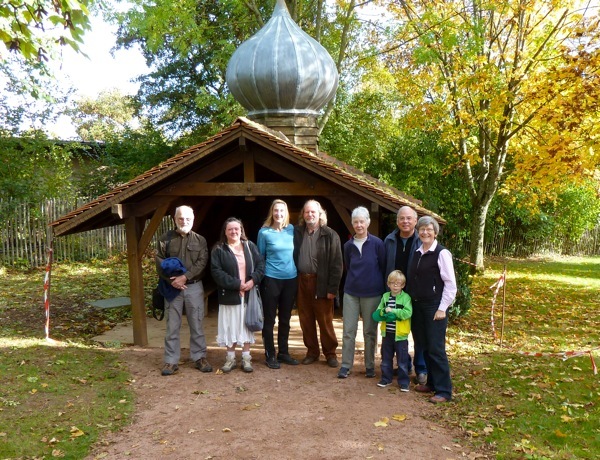 Shortly before noon, local and vacationing friends along with Taize brother John (not pictured) gathered for a short service of remembrance and some officially sanctioned ash scattering near a small shrine just down the hill a bit from the main church at Taize. This entry was posted in Middle widow, On the road and tagged Ameungy, Taizie. Bookmark the permalink. 3 Responses to Gathering on the first anniversary – c’est bon! You are having a lovely remembrance. I’m happy for you!! Lovely photo and remembrance day Linda! Thinking of you lots this week. Hope we can get together when you’re back stateside. Weather looks gorgeous too. What a great way to celebrate Chris! !